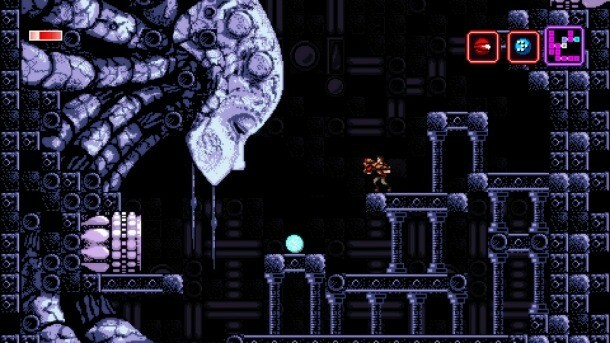 Developer Tom Happ has revealed the release date for the upcoming sci-fi sidescroller, Axiom Verge, which is slated for March 31. On the PlayStation Blog, Happ gives details on the inclusion of power ups that will be used for solving puzzles and finding new areas. First, there is Nova, a new weapon that can be shot in two ways: either you shoot it normally, or detonate it in mid-air, splitting the bullets into pieces for added proximity damage. There is also a drill for breaking rocks and other materials, as well as an address disruptor to glitch enemies and environments. This retro-inspired indie platformer has been compared to classics like Super Metroid and Contra. Gameplay includes exploration, challenging combat, a speedrun mode, and more. Axiom Verge will be released next month, on PlayStation 4, Vita, and PC.